A-HOTEL.com - Luxury and cheap accommodation in Atemar, Russia. Prices and hotel, apartment booking in Atemar and surrounding. Featuring city views, Квартира Татьяны Бибиной 1/7 is set in Saransk, around 6 km from Mordovia Arena. The property was built in 2017 and features air-conditioned accommodation with a balcony. Featuring air-conditioned accommodation with a balcony, Квартира is set in Saransk. 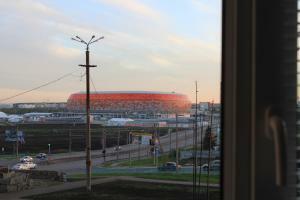 The Mordovia Arena and the Sobornaya Square are within 6 km and 7 km of the apartment, and free WiFi is provided. Апартаменты Т.Бибиной 1/8 offers accommodation in Saransk, 6 km from Mordovia Arena and 7 km from Sobornaya Square. Situated 6 km from Mordovia Arena, 6 km from Sobornaya Square and 7 km from Saransk Botanical Garden, Комфортная двухкомнатная квартира Премиум класса provides accommodation set in Saransk. The accommodation is 7 km from the Pushkin Park. Situated in Saransk, just 6 km from Mordovia Arena, Apartment on Tani Bibinoy 3/6 features accommodation with free WiFi. This apartment provides accommodation with a balcony. Located in Saransk, 4 km from Mordovia Arena and 4.4 km from Sobornaya Square, Volgogradskaya 114a offers air conditioning. Apartment na Sevastopolskoy offers self-catering accommodation in a residential area of Saransk. Free WiFi access is available. Within 3.2 km of Mordovia Arena and 3. Located in Saransk, 1.5 km from Mordovia Arena and 1.